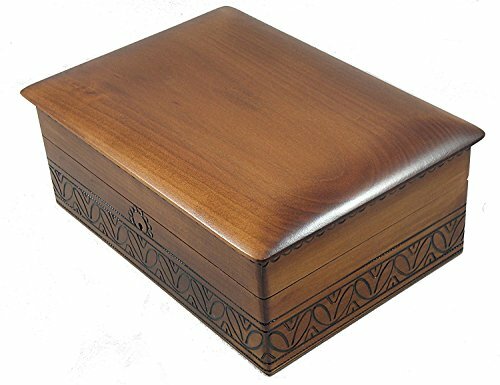 This very large Linden Wood box is large enough to hold all your jewelry and keepsakes! Measures (Outer Dimensions: 10.25 inches x 7.25" x 4.25" Inner Dimensions: 9.25" x 6.25" x 2.75") inches. Perfect for your cufflinks, desk accessories or mementos. Great for a desk too. Large enough for envelopes or pens and other desk clutter. Inside does not have sections for different types of jewelry so you can store whatever you want inside. Perfect gift for a man or a woman! Comes with brass lock and key. Polish boxes are made in the mysterious region of the Tatra Mountains, discovered by the nineteenth century poets and pronounced a fairyland of legends, miracles and natural wonders. In today's world of mass production, finely handcrafted boxes bring, along with their grace, the charm and passion of human imagination. The prime finish of the interior compartments assures the proper aura for memorabilia, treasures and jewelry. The art of hand crafting and carving wooden boxes, a rare skill of folks living in the Tatra Mountains, was adopted to evoke the symbols, icons and styles of the multiethnic and cross-cultural communities of the industrialized world. Outer Dimensions: 10.25 inches x 7.25" x 4.25" Inner Dimensions: 9.25" x 6.25" x 2.75"
If you have any questions about this product by Enchanted World of Boxes, contact us by completing and submitting the form below. If you are looking for a specif part number, please include it with your message.